Jeremy and I got to take a trip to Mammoth recently with a great group of friends. I was excited because believe it or not, I’ve lived in California my whole life, and I’d never been to Mammoth! Add that to the fact that I rarely go anywhere these days (it gets difficult when I’m not 100% healthy), so I was really looking forward to getting away. That being said, I’m always a little nervous when I travel because finding food I can eat on the road is usually a challenge. So that inevitable question loomed over me: what in the world was I going to eat? This organic and all natural bakery is truly a special find for those that want to indulge in some treats while visiting Mammoth. 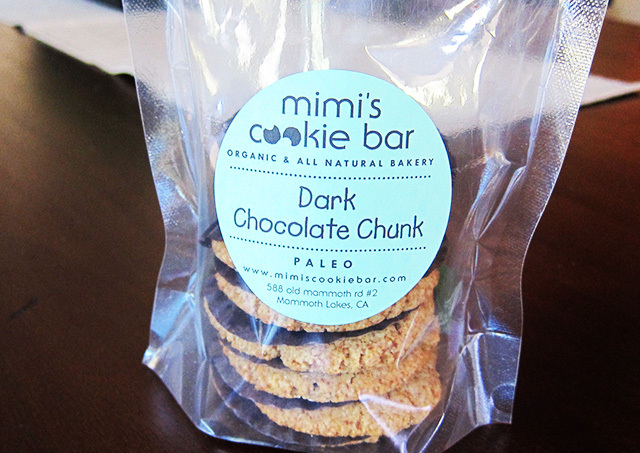 Not only does Mimi’s Cookie Bar offer gluten-free cookies, cakes, cupcakes, pies and other sweet snacks, but they also make Paleo and vegan cookies! 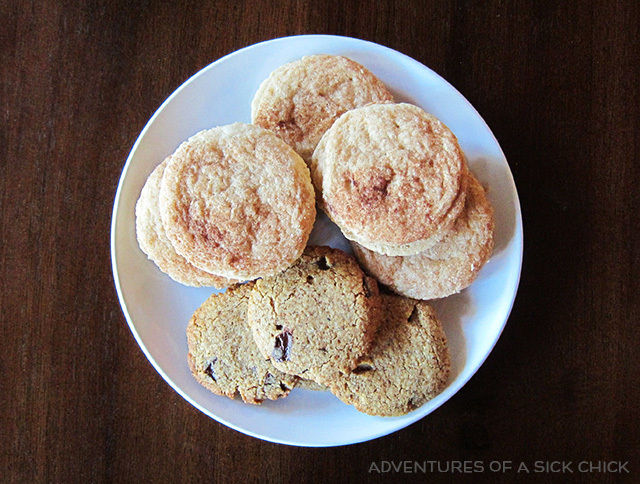 I enjoyed trying out the Paleo Dark Chocolate Chunk Cookies, and their Gluten-Free Snickerdoodle Sandwich Cookies are amazing. (I also tried a sample bite of their naturally gluten-free Florentine cookies, and I could have eaten a whole plate of those.) This adorable eco-friendly bake shop takes pride in using quality organic or all-natural ingredients and supporting local organic and fair trade farms. 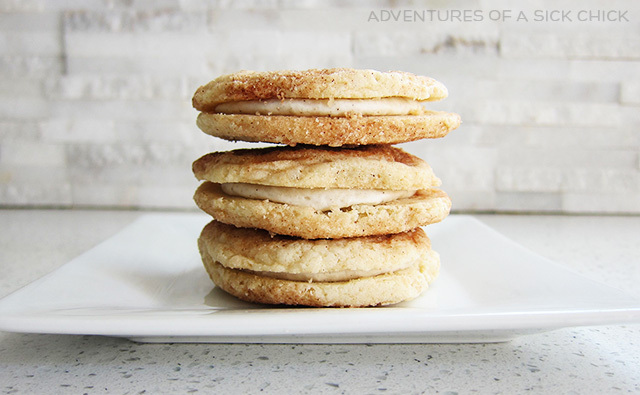 If you want a delicious gluten-free treat, I highly suggest checking out their creative selection (just be sure to place orders in advance for most items). First of all, I have to apologize for the less-than-desirable food photo. We went to dinner at Campo to celebrate our friend Tiffany’s birthday, and I was so excited that I dug into my food before I could snap any proper photos (not too mention the photo was taken under dim indoor lighting). Hopefully we made up for it with our handsome group photo (wink, wink). Now where was I? Oh yes, the restaurant! 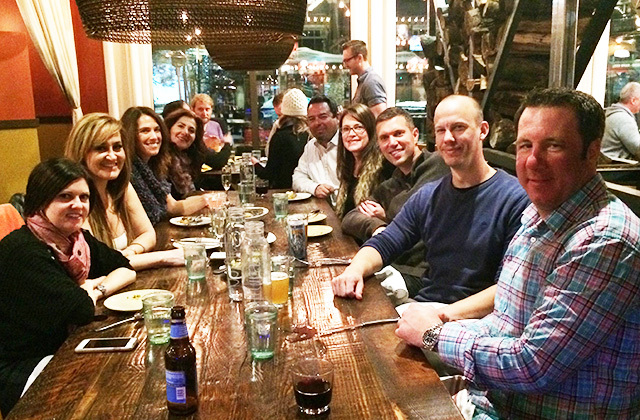 Campo is a rustic Italian restaurant located in the Village, and what a perfect find. Not only was everything at Campo mouthwateringly delicious, but they are very gluten-free friendly and identify gluten-free options on their menu. Of course, I knew that I should stick with a Paleo-friendly meal, but I couldn’t resist trying one of their gluten-free pizzas as well. So Jeremy and I decided to order two entrees and split them so we could enjoy the best of both worlds. 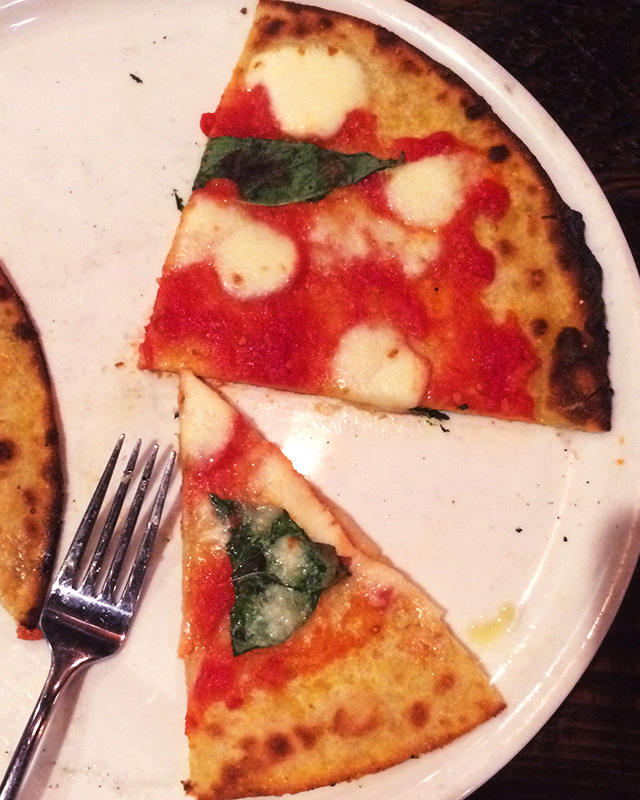 We shared a “good-for-us” entree (their Fish of the Day: salmon with white asparagus), and then felt totally justified in enjoying their gluten-free Margherita Pizza as a special treat (and all I have to say is, “Wow!”). I also got to have a taste of the Fritto Misto (fried calamari coated in rice flour) and their Crispy Polenta appetizers (both gluten-free and beyond delicious). It’s a rarity to have so many options to choose from on a restaurant menu, so I fully enjoyed this meal. Of course, even with the gluten-free identifications on the menu, I still verified each dish with our server, just to be sure. Our gang had split up to enjoy different mountain activities (skiing, snowboarding, snowmobiling, etc. ), so there was an afternoon when I was on my own to grab lunch. Although I tried researching gluten-free options online beforehand, I wasn’t having much luck finding any gluten-friendly menus at our location. 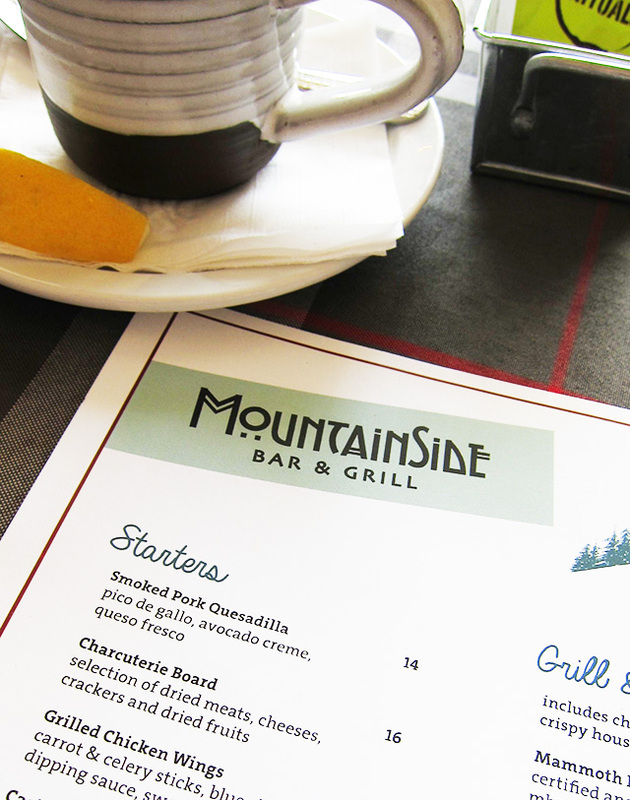 I ended up taking a chance on the Mountainside Bar & Grill at the Mammoth Mountain Inn, and I’m glad I did. Before sitting down, I waved down one of the employees and asked if the restaurant could accommodate someone with a gluten intolerance (I always like to get a feel if their menu doesn’t indicate any kind of gluten-free awareness). Turns out I chose the right employee: she lit up the moment I asked because, as she kindly shared with me, she had Celiac. I was almost relieved to hear it — not relieved that she had Celiac, of course, but relieved that I knew she understood my situation and would be able to offer me trustworthy advice. When you have food allergies or intolerances, it’s sometimes hard to trust servers (even those with the best intentions), because there is still such a lack of awareness. Luckily, I had flagged down the right person, and she provided me some personal recommendations of menu items which I could order and/or alter to meet my needs. And it’s a good thing I did, because when I finally sat down, my actual server was not very informed and very unsure of answering my questions (in his defense, he was new). I suppose my point is, don’t be afraid to ask, even if you have to ask for a manager or someone else who could offer informed help. 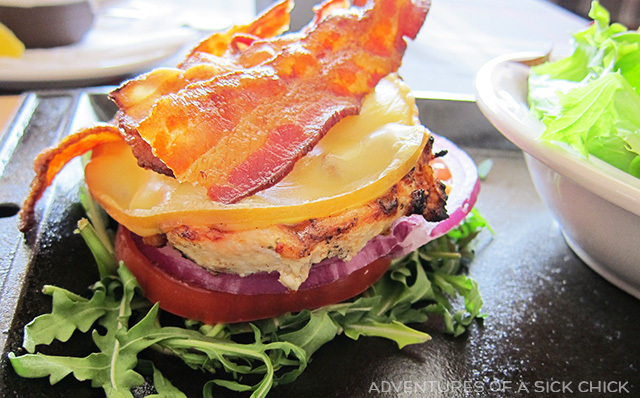 Per the recommendations I received, I ended up ordering the Chicken Sandwich — without the bun and aioli sauce — set on a bed of arugula, topped with smoked gouda and bacon, with a lovely salad on the side. The meal was not only gluten-free, but also turned out to be Paleo (okay, the gouda is the gray area here but just go with it), and it was delicious! I had my GlutenEase with me, which helps me feel more confidant about accidental gluten exposure (and purposeful dairy exposure), so I enjoyed my meal in full confidence. The restaurant and bar had a striking view of the snow-covered mountain, so I couldn’t have asked for more. This was our last stop in Mammoth, as we decided to grab breakfast to-go before we got on the road to drive home. Stellar Brew & Natural Cafe was one of the few establishments that popped up when I researched eating gluten-free in Mammoth, so I was determined to try it. And I’m so glad we did! 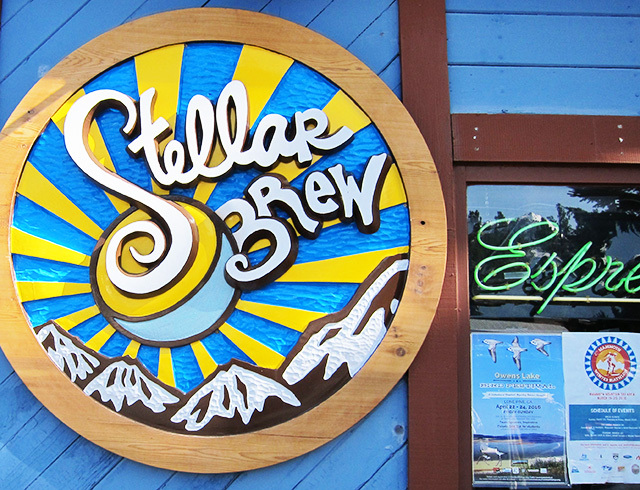 Stellar Brew offers breakfast and lunch items, as well as a wide array of organic coffee selections, and the emphasis is on fresh, healthy, local and seasonal (and some organic) ingredients. Most menu items can be made to order as gluten-free and/or vegan. I ordered the Stellar Sammy breakfast sandwich on gluten-free bread, and it was remarkable (the bread was exceptionally good considering it was gluten-free). Jeremy had the breakfast burrito (not gluten-free) and really loved it. 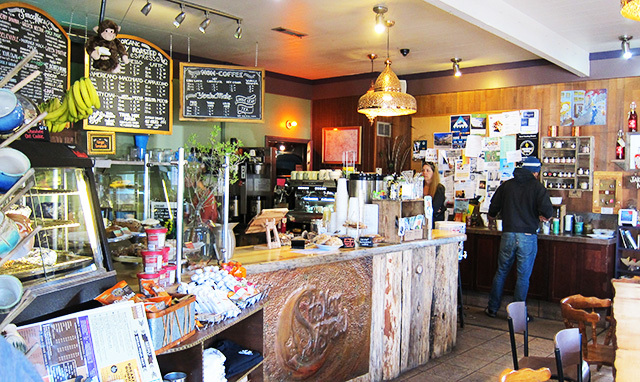 If you’re looking for a healthy and delicious breakfast or lunch in Mammoth, make sure this charming little cafe is on your itinerary. 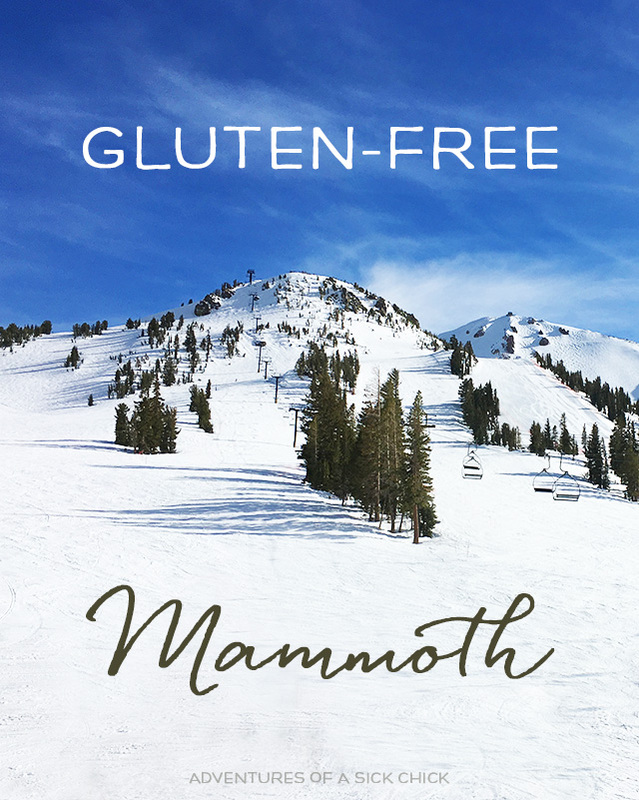 Have you visited other gluten-free friendly establishments in Mammoth? If you have, please comment and share!